K9 Competition - The BIS Maker!!! K9 COMPETITION is made in Sweden of the best natural ingredients available on the market, in order to make your wise environmental choice simple. The products have a calming effect on sensitive skin and scalps and do not irritate. K9 COMPETITION FORMULA adds the active ingredients in perfect harmony, in order to give nourishment, moisture balance and optimized coat quality. The products are easy to work with, disentangling and shorter drying time . 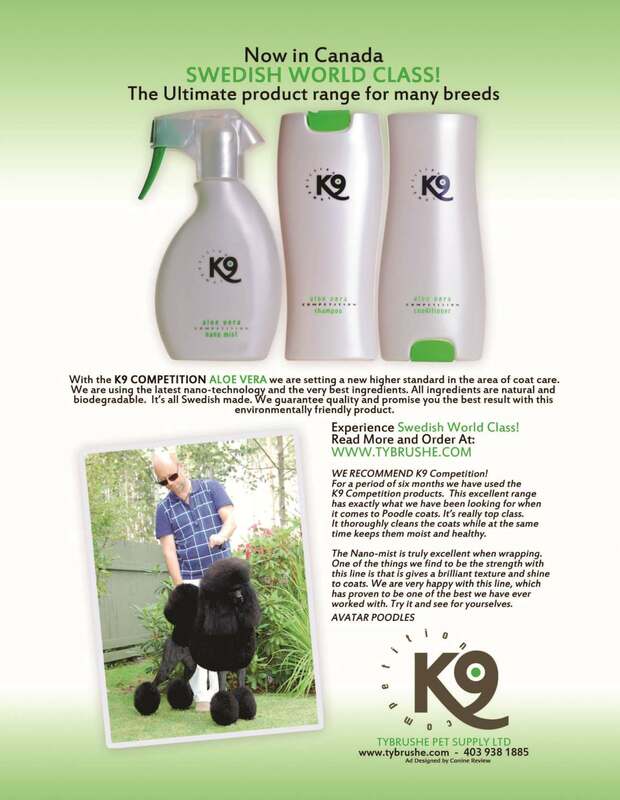 K9 COMPETITION is suitable for all kinds of pets, coats, breeds and puppies. The carefully tried out formula gives the wonderful skin and fur quality that we aim for – for competition and for everyday use. The other ingredients are also plant based and biodegradable and make K9 COMPETITION an environmentally wise choice. See qualities of the individual ingredients at the bottom of this page. We know many Show people buy like groomers so now you can save like a groomer too! is a natural, mild and economical shampoo. It has a calming effect on sensitive skin and scalps and does not cause skin irritation. It adds nourishment, perfect moisture balance, and optimized coat quality. It is detangling and timesaving and makes coats dry quickly. Suits all types of pets, coats, breeds and puppies and is equally suited for competition and daily use. Instructions: Massage thoroughly and rinse. Dry skin/coat = cool water. For optimal results, finish with K9 ALOE VERA COMPETITION CONDITIONER. Can be diluted up to1:20. Content: Aqua, mg laurylsulfat, cocobetain, certifierad aloe vera, cocoamphodin, D-panthenol, wheat protein, fragrance, preservative. gives the coat a natural shimmering white colour without bleach. This balanced formula with 100% Aloe Vera, D-Panthenol and wheat protein acts calming on sensitive skin, provides optimal moisture balance and healthy, nourished coat. It’s economical in use and makes coat care easy with perfect long lasting show result. For best results, repeat once. Content: Aqua, mg laurylsulfat, cocobetain, certified aloe vera, cocoamphodin, D-panthenol, wheat protein, scent, preservative, color pigment. Neutralizes discolouring and brings out the natural deep color in the coat. This balanced formula with 100% Aloe Vera, D-Panthenol and wheat protein acts calming on sensitive skin, proivides optimal moisture balance and healthy, nourished coat. It’s economical in use and makes coat care easy, with perfect long lasting show result. Instructions: Use as it is or dilute up to 1-10. Rinse with warmer water on oily coats and colder on dry. For best results, repeat once. liberates the coat and hair from build-up and residue! This deep cleansing shampoo gently removes build-up of active additives, excessive dirt, oil and pollutants that weigh the coat down. After strip off, use K9 Competition Aloe Vera Shampoo and Conditioner to give optimal coat status and long lasting result. Instructions: Wash careful and rinse. Repeat once for best result. Warmer water gives more effect. Can be used as it is or dilute up to 1-10. Content: Aqua, mg laurylsulfat, cocoamphodin, iminodisuccinat, cocoamphopolycarboxyglycinate, cocoamide, fragrance,preservative. is economical and highly conditioning. It gives the coat a beautiful lustre, makes it easy to detangle and has an antistatic effect. It optimizes volume and moisture balance. It is timesaving, since it makes the coat easier to work with and dries more quickly. Instructions: Start by washing with K9 ALOE VERA COMPETITION SHAMPOO. Apply the conditioner onto squeeze-dried coat and massage gently. Leave in for a moment and then rinse. Dry skin/coat = cool water. Greasy = warmer. You can Repeat the treatment. Can be diluted up to1:40. For maintenance baths don't rinse out as much, for show baths rinse out a bit more but don't fully rinse. Content: Aqua, steramidopropyl lactate, certified aloe vera, weat germanidopropyl lactate, D-panthenol, wheat protein, fragrance, preservative. Instructions: Spray onto dry or damp coat to facilitate and protect when brushing. Spray directly on knots and massage when detangling. Content: Aqua, certified aloe vera, weat germanidopropyl lactate, wheat protein, steramidopropyl lactate, D-panthenol, nano-liposomes, fragrance, preservative. is for wire/coarse coat type breeds. this spray gives extra hold and texture to coats that needs a firmer volume and feeling. Antistatic, de-tangling, moisturizing and protects the coat. Makes the coat easy to brush and will not damage the hair. Brings out the natural shine. Alcohol free. IN A HANDY LITTLE BOTTLE! It counteracts tangling, split hair ends and static electricity. Just smooth it out in the palms of your hands and apply to the coat. A few drops will do it! with powerful Vitamin/Protein/Keratin Complex increases the level of moisture, repair and control that damage and ragged coats needs. With K9 Intensive Coat Cure you will get a sleek, easy maintained and transformed coat with luscious shine. Super-rich, deep conditioning mask intensely moisturizes while helping control and repair extremely dense and dry coat. Instantly detangles and improves combability so the coat resists breakage. Provides Aloe Vera, B5 Vitamin, Wheat protein and Keratin for a smoothing control and internal strength. Coat texture is transformed with increased manageability, shine and colour. Can be used on a regular basis or weekly as an intensive treatment. A gentle and effective way to clean your animal’s ears. Dissolves smelly wax. Also works great as a preventive measure. Alcohol-free. Essential oil-free. In case of severe irritation, seek advice from your vet. is a mild formulation with an ultra-restoring blend of Keratin Protein and D-Panthenol that makes the coat incredibly healthy and smooth with amazing shine. Ideal for all coat/hair types. Heals excessively damaged coats. – Boosts hair’s strength and elasticity. Reduces drying time. is a super moisturizer and restoring conditioner with a blend of Keratin Protein and D-Panthenol that makes the coat incredibly healthy and smooth with amazing shine. Ideal for all coat/hair types. Heals excessively damaged coats. Boosts hair’s strength, combability and elasticity, super quick drying time. Reconstructs hair shafts. is an ultra-restoring leave in spray conditioner with a blend of Keratin Protein and D-Panthenol that makes coat incredibly easy to brush and with an amazing shine and softness. Ideal for all coat/hair types. Boosts hair’s strength and elasticity. Eliminates static electricity and reduces detangling time. NCI: Aqua, Cetyl Stearat, Stearalkonium Chloride, Hydrolyzed Keratin, D-panthenol, Sodium PCA, Parfum. is an super effective whitening shampoo without bleaching but with superior cleaning and whitening effect through a revolutionary formulation that has the ability to clean and moisturize at the same time. Makes a snow white and glossy coat without dryness. Removes urine stains, dirt and yellowness. Gives great moisture balance and great shine with K9′s optical Keratin and D-panthenol complex. You can dilute with water up to 1/10. For additional sustainable whiteness and fur quality use K9 Sterling SilverConditioner. is the only whitening conditioner of it´s kind! This revolutionary formulation gives the coat a brilliant white shine and extreme moisturizing effect by K9′s unique optical, Keratin and D-panthenol complex. Makes the coat easy to brush with a long lasting results and extremely short drying time. Suitable for all animals and breeds. The most important “constructor” of the skin and the coat. Vitalizes skin and hair follicles. Have a decisive effect on the result and top finish by means of the extremely small molecules contributing to an in-depth treatment of the hair shaft. The above active ingredients, when combined, have a synergistic effect for optimal hair and skin quality. The carefully tested formula gives the wonderful skin and fur quality that we aim for, for competition and for everyday use. The above ingredients, when combined have a synergistic effect for optimal hair and skin quality. The carefully tested formula gives the wonderful skin and fur quality that we aim for - competition and for everyday use. Our other ingredients are also plant based and biodegradable and make K9 COMPETITION an environmentally wise choice.